Winter is a beautiful time of year. However, it can be quite a challenge driving in winter weather even if you are driving a truck. There are some useful tips though, that will help you stay safe on the roads during winter, and the top ones are listed below. We hope that these tips help you and your family stay safe through the icy weather. It is essential that you and your passengers wear your seat belts at all times. You never know when your vehicle or a vehicle near you may skid. If you were to get in an accident, a seat belt could very well save your lives. Since ice and slippery roads are common in the winter, always drive at a proper distance from vehicles in front of you. Even if you are in a rush, keep at least two car-spaces in between your vehicle and the one in front of you. If you are traveling near a snow plow, be extra cautious and keep your distance. 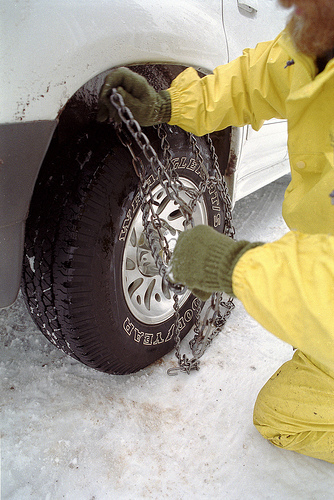 Regular tires can lose their traction on icy roads. During the winter months, it is best to invest in snow tires and/or tire chains for your vehicle. This will help provide the traction you need to drive on ice-covered roads. Traveling with several large bags of cat litter or play sand in your trunk can provide traction as well. When driving in winter, you should always be prepared. Some tools you should carry with you include a cell phone, warm gloves, de-icer, a snow shovel, an old rug, a window scraper, and a large bag of cat litter or play sand. If you happen to get stuck in snow or on ice, the gloves, shovel, rug, cat litter and play sand will be quite useful. Finally, always drive slowly and carefully during the winter and be extra careful on bridges. If you find yourself in a storm and cannot see, pull over if you need to. For more information pertaining to used trucks and equipment, be sure to visit SalvageTrucksAuction.com.